Many many homeowners already have a free renewable heat store built into their homes, the attic. By using a new smart system the free solar heated air can be harvested to reduce your home heating costs by many £10's or £100's each year and reduce fossil fuel use. Heat transferred from your attic can be 10 to 50+ times less expensive than heat provided by your current heating system. This webpage gives some system background, demonstration charts and explanations of Solar Space Heating operation, and system performance charts from 2012 to 2017. The prototype Solar Space Heating system was retrofitted to and developed in an existing 4 story home at Balerno, Edinburgh, Scotland. The parts cost for the system is currently just some £500. The solar heated air had to be ducted down 3 storeys by a tortuous route from high in the attic to a large open plan kitchen, dining, and lounge area. The complicated duct route reduced the airflow by 3 times. More background on system development. It is a great low maintenance, low cost, money saving system that we can easily adjust which we are delighted to have installed in our home! 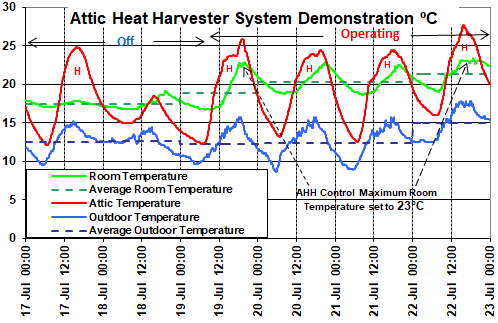 The charts below show home temperatures over a 6 day period with the Attic Heat Harvesting System both Off and Operating at an early stage of the product development. The dark blue horizontal dashed line shows the daily average outdoor temperature over each 24 hour period. The dark green horizontal dashed line shows the average home temperature over the 6 day period, this increased by 3°C on 19th to 21st July and by 4°C on 22nd July. 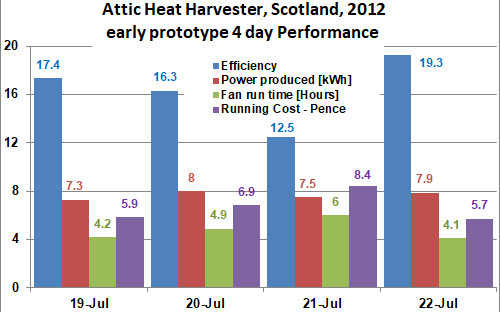 The second chart shows the system performance during the period that the Attic Heat Harvester was operating, the total cost of the harvested heat over the 4 days was £0.27 and 30.7kWh of heat was transferred. Our Solar Space Heating systems are controlled by a microprocessor based custom controller developed specifically to efficiently harvest solar heated air. 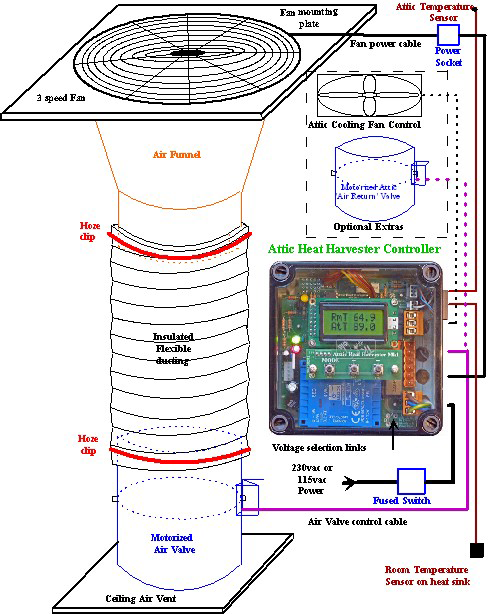 The controller continually monitors two temperature sensors and, when free solar heated air is both available and required , opens an air valve on attic heat harvester system's then turns on a fan. The fan is turned off and the air valve closed when the temperature difference between attic and home air falls below a user pre-set minimum (which impacts the system efficiency), or when the room temperature reaches a user pre-set Maximum Room Temperature, as indicated by the flat tops to the room temperature green line in the chart above. 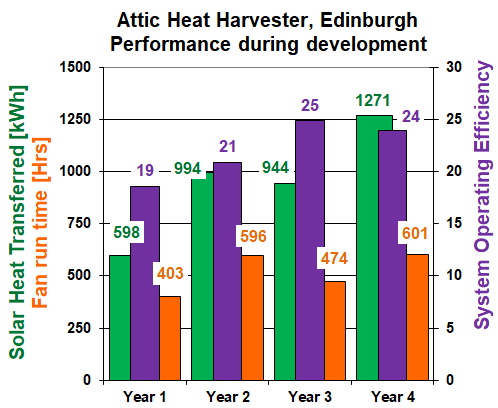 Between 2012 and 2015 work continued to improve the Attic Heat Harvesting system efficiency. The impact of the performance improvements realised can be seen in the system performance histograms below which show 2012 to 2015 annual system performance figures and the 2015 system monthly performance. In 2015 the Balerno system harvested 1,271 kWh of free solar heat at a total running cost of £7.40. The average Attic – Home Temperature Difference recorded by the controller was 4.8°C. In 2017 to provide 1271 kWh of heat using a conventional Oil or Gas or LPG central heating or a Heat Pump system would have cost some £60, electrical central heating would cost some £193. – Figures are based on data from Which.co.uk. 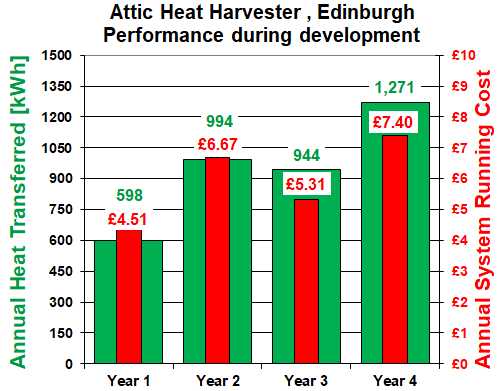 In 2016 and 2017 the Balerno Attic Heat Harvesting system transferred 2000 kWh of heat at an operating cost of £14.90, this amount of heat from a conventional gas fuelled central heating system would have cost £90, and from an electrical heating system £304. The following histograms show Balerno Solar Heat Harvester System 2015 monthly performance. 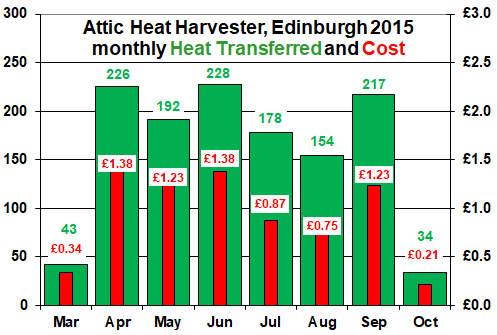 Most heat was transferred from the attic to the home in April, May, June July and September. The monthly system efficiency was highest during July and August as the attic-home temperature differences were higher. The Solar Heat Harvester System controller only transfers hot solar heated air when it is both available and needed. The main factors that determine how much solar heat is transferred each month depend on: a) the location of the home, b) the home’s characteristics, and c) the local weather. When the system is fitted to a single or two storey home the system efficiency would be some 3 to 2 times higher and the running costs would be 3 to 2 times less as there would be little or no obstruction to a smooth air flow caused by the ducting. A system fitted to a 2 storey US home in 2012 achieved an efficiency of 42.3 in 2017. Using Solar Heat Harvesting systems as a secondary heating system is the best way to reduce your heating costs and your carbon footprint. The fan used in the Balerno 2012 installation was 450mm in diameter, this required a funnel to reduce the diameter to suit the 305mm insulated duct and air valve. Since then the range of energy efficient fans is far greater.